Jeanneau has a big surprise in store at the Nautic de Paris Boat Show, which will open its doors at the beginning of December in Versailles: the fabulous all new Merry Fisher 1095. This is an outboard powered weekender, with crucially three double cabins… A first on the market and destined to be very very popular! Until now, the Merry Fisher range offered 4 models: the 605, 695, 795 and 895. The new Merry Fisher 1095 completes the range, positioning itself as a unique offer in the marketplace with a 10.50m overall length and 3.35m wide. Logically it seems a pair of 300hp outboards by Yamaha, Jeanneau’s title partner will be the engine of choice but alternatively here at Morgan Marine we can offer Honda as a great alternative. 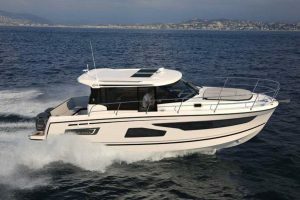 Designed by Centowski & Denerd Design / Jeanneau Design, the new for 2018 Merry Fisher 1095 clearly displays a strong family resemblance to the rest of the range, with its timeless style, a wheelhouse with nice large windows, a side door at cockpit level, asymmetric gangways – wider and deeper to starboard – and a modular cockpit with a large L-shaped bench. Inside, the new Merry Fisher 1095 will benefit from high quality materials seen in the last boats launched by Jeanneau, with a choice of materials and high-level assembly. Details still to be released on this. located behind the helm seat, makes the saloon & cockpit link to make a huge entertaining area. The six berths are located at the front of the new Merry Fisher 1095 in three cabins, including a large owners cabin located in the bow – with a vast island bed – two guest double cabins and a beautiful bathroom with separate shower. Superb used Cap Camarat 5.5 just in!